Many of you will know that the Oxford English Dictionary has named "omnishambles" as the word of the year. It was first used in 2009 in the BBC television political satire The Thick of It but it is the perfect word to describe this year's weather. So what's to come? Well, the first real sign of winter came with an early frost in the third week of October followed by a period of higher than normal temperatures interspersed with another couple of over-night frosts, which were low enough to create a thin covering of ice on local ponds. Log burners and open fires were lit and the sweet, spicy, nose prickling smell of wood smoke drifted across the village heralding the arrival of colder weather and the morning ritual of scraping ice off windscreens. But as Percy Bysshe Shelley wrote "If winter comes can spring be far behind" and so we've Christmas in a few weeks after which daylight hours get longer. Ash dieback, a serious disease of ash trees caused by the fungus Chalara fraxinia,has been the subject of a great deal of discussion in newspapers and the media generally over the last three months. The infection, which causes leaf loss and crown die back leading to death of affected trees, has caused an enormous loss of ash trees in many northern European countries and was first seen in Poland in 1992. It was initially identified in the UK in February 2012 at a nursery in Buckinghamshire on stock imported from Holland and has now been found in a number of sites across south eastern counties. Being a fungus the disease is spread by spores which are dispersed by the wind however, it is reported that some trees have a natural resistance. 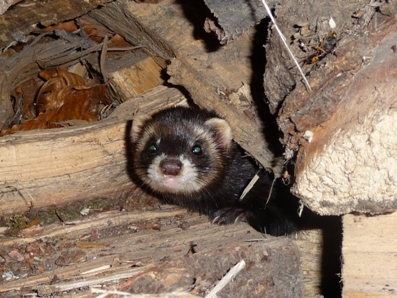 Marion Warner kindly sent me a photograph of a young polecat taken by her son who lives in Wales. The European Polecat (Mustela putorius) is a member of the weasel family that includes otters, martens, stoats, mink and badgers and was not recorded in the UK until after the Norman Conquest when they were introduced to catch rabbits - they were mentioned by Chaucer in The Pardoner's Tale. They are generally dark to light brown with a pale underbelly and light patches across the face. They are carnivores feeding on small rodents, amphibians and birds such as pigeons, grouse, partridge and chickens. It is this fondness for domestic poultry that is believed to be the reason for the name, with Pole coming from the French word poule. They have a myriad of dialect names but were known in the south of the country as fitchou and in the north as foumart both names referring to their foul smell. The polecat was the ancestor of the domestic ferret with which it crossbreeds. The polecat (male known as a hob and female as jill) mate in March/April and give birth to between 5 - 8 kits in early summer which are weaned in about four months when they become independent. At one time polecats were hunted for their pelts which were used in the fur trade particularly in the north and Scotland but they were increasingly trapped because of their predation of chickens and game birds with many parishes offering a bounty on them and together with gamekeepers they were trapped almost to extinction by the early 20th century. As a result of reintroductions in the 1970/80's this shy, fascinating animal now has a range that covers western central England and Wales.